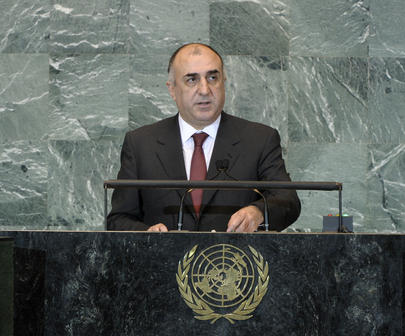 ELMAR MAMMADYAROV, Minister of Foreign Affairs of Azerbaijan, said his country was ready to contribute to more effective mediation, but not all States approached international obligations responsibly. “For almost two decades we have been facing the flagrant violation of the [United Nations] Charter and other documents of international law by the Republic of Armenia, which perpetrated aggression against the sovereignty and territorial integrity of the Republic of Azerbaijan. As a result of this aggression, almost 20 per cent of the territory of Azerbaijan continues to remain under occupation and about 1 million Azerbaijani refugees and internally displaced persons are unable to return to their homes,” he said. The Security Council in 1993 adopted four resolutions demanding immediate withdrawal of Armenian forces from all territories of Azerbaijan, but Armenia continued to ignore the calls of the international community. Even more worrisome was that, instead of preparing its people for a prosperous and stable future with neighbouring countries, Armenia’s leaders incited future generations to new wars and aggression, propagating hatred of Azerbaijan and other peoples of the region. Illegal implantation of ethnic Armenian settlers and destruction of cultural heritage were another source of serious concern, he said. “Earlier in this hall we have witnessed a very aggressive and unconstructive statement of the President of Armenia. He openly confirmed this destructive policy of Armenia,” he said. The Field Assessment Mission to the occupied territories conducted by the Organization for Security and Cooperation in Europe (OSCE) Minsk Group co-Chairs last October stated the occupation was unacceptable and urged Armenia to end its illegal practices in those territories. “It is absolutely illogical when the leadership of Armenia, who has implemented the total ethnic cleansing of not only the occupied territories of Azerbaijan, but also its own territory from their Azerbaijani population, is trying to apply the principle of self-determination. It is obvious that one cannot expel peoples from their homes on ethnic grounds and, at the same time, speak about self-determination on the same ground for those who remained,” he said. Resolving the conflict must start with withdrawal of Armenian armed forces, followed by restoration of communications, return of refugees and internally displaced peoples and creation of conditions for peaceful coexistence of Azerbaijanis and Armenians in the Nagorno-Karabakh region with the territorial integrity of Azerbaijan, he said. Azerbaijan believed the international community would convince the Armenian side to cease abusing the right of Azerbaijanis to live within their own territory, including the Nagorno-Karabakh region; in return, Azerbaijan was ready to guarantee the highest level of self-rule for this region. To contribute further to peace and help redress under-representation of small developing countries, Azerbaijan had put forth its candidature for a seat in the Security Council for the 2012-2013 term and would highly appreciate Member States valuable support. Azerbaijan’s representative said that those remarks testified to Armenia’s disregard of its Charter obligations, and revealed how far it was from engaging in a constructive search for peace. It was curious that Armenia — which had unleashed a “war of aggression” against Azerbaijan, carried out “ethnic cleansing” during the conflict and advocated racist ideologies — lectured Azerbaijan on peace, human rights and conflict resolution. Armenia must be aware that what it considered the self-determination of Armenians living in Azerbaijan had been qualified in the Security Council and the General Assembly as an illegal use of force against the sovereignty and territorial integrity of Azerbaijan. The illegality of the separatist entity established on Azerbaijani territory had been stated at the international level in an unambiguous manner, he said, adding that Armenia had purged occupied areas of Azerbaijan of non-Armenians and had created a mono-ethnic culture. Armenia’s attacks over the last month against Azerbaijanis and increase in hostile statements by its leadership as to the root causes of war only confirmed the validity of concern about the destabilizing effects of Armenian policy. He was confident that that agenda was fated never to be realized. Armenia would be obliged to cease its provocative policy, denounce its territorial claims and establish civilized relations with all countries in the region. There was no alternative to peace, stability and mutually beneficial cooperation.